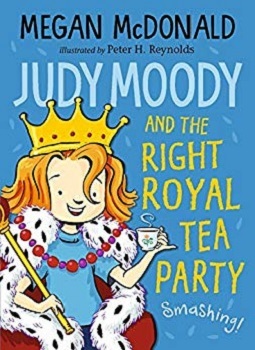 Bad moods, good moods, even right-royal-tea moods – Judy has them all in this brand new adventure, perfect for fans of Jacqueline Wilson and Lauren Child. With Grandma Lou’s help, Judy has dug up proof that some old-timey Moodys lived in merry olde England. In fact, if her grandpa’s notes are right, Judy might even be related to — royal fanfare, please – the Queen herself! But then Judy’s family tree gets a few more shakes and some more surprises come tumbling out. Now Judy has some right royal family secrets she’d like to keep hidden away, especially from Jessica, the princess in pink! Judy Moody is back. In this hilarious story, Judy is learning all about her family tree when her Grandmother mentions to her that the name has changed over the years from Mudeye to Moody and that they came from England. There was even a relative who saved a princess from the Tower of London. Judy being her usual self, takes this to mean that her distant relative must have been a prince and that must make her royalty – All hail Queen Judy! Have fun with Judy and her friends as she gets used to being a Queen. This is the third book in the Judy Moody series that I have reviewed and they have all been excellent reads and great fun. With currently thirteen books in the series, plus a spin-off called Stink (Judy’s little brother) and a movie too, readers will have a lot to get through and keep them interested. As per usual with these books amongst the story there are snippets of factual information. These books are for the more confident reader. The font is larger than what you find in books for adults and there are also black and white illustrations throughout which have been exquisitely drawn. For children looking for something fun and interesting to read this series is just perfect. Judy gets up to something completely different in each book and she is a wonderful, enjoyable character to spend your time with. My little sister would love this series. Going to order some for her today. Wonderful, I have read three of the books and they have all been just amazing. I hope yous sister enjoys them.